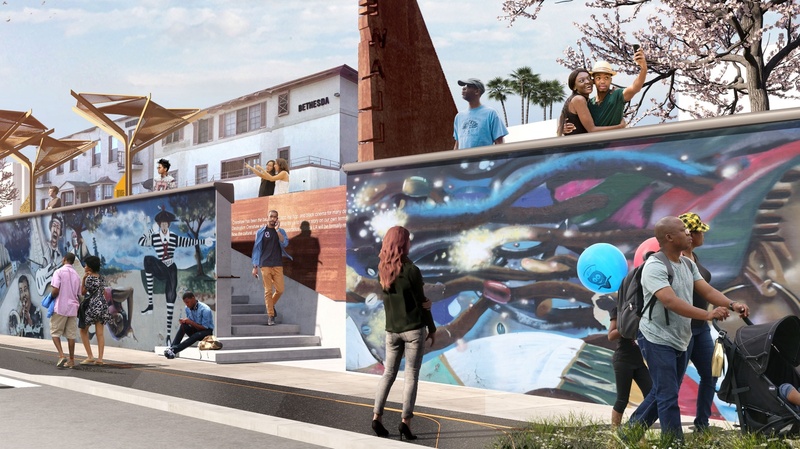 Proposed makeover of the iconic Crenshaw Wall, including art restoration, wall stabilization, and the installation of aparklet, including signage, shade structures, and landscaping. Rendering courtesy of Perkins+Will. When Metro announced that a 1.3 mile section of the Crenshaw/LAX light-rail line, currently under construction, was planned to go through Crenshaw’s main thoroughfare, Councilman Marqueece Harris-Dawson was unhappy at first. But then he saw it as a cultural opportunity. “Los Angeles has one of the last intact African-American communities anywhere west of Chicago, and the community’s made incredible contributions to the rest of the country and the rest of the world. The holiday of Kwanzaa, created right here in Los Angeles along the Crenshaw corridor. Soul Train, the longest running television show and the show that really defined culture and cool for several generations, right here out of the city of Los Angeles. And so many other inventions, contributions and movements come out of this city,” Harris-Dawson said. 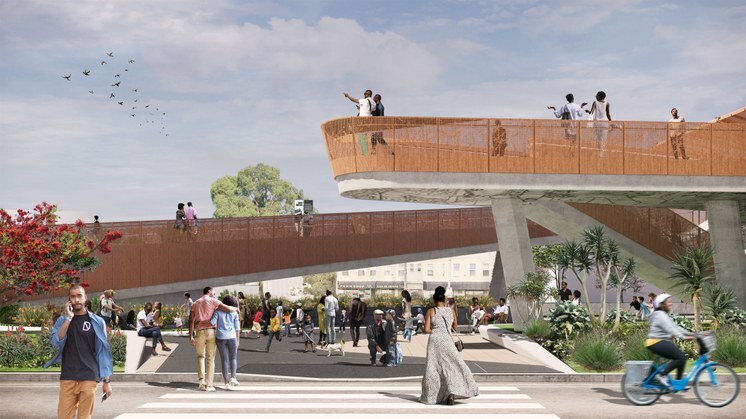 So now artists, curators, architects and landscape designers are busy developing plans for Destination Crenshaw, a 1.3 mile public art spectacle that will include a new public amphitheater with a raised overlook; pocket parks and parklets, hundreds of new trees and rotating works of public art by key African American artists. Ron Finley, known as the “guerilla gardener,” is also involved with the design of Destination Crenshaw and its planning. “It's our Masada. It's our Little Bighorn, because of the gentrification that's happening. When we designed this project, our initiative was to be unapologetically black, because there's nothing in this city that represents black Los Angeles. And that's what this project is going to be,” Finley said. One of design team leaders is Zena Howard, a partner with Perkins+Will, the architecture firm that co-designed the Smithsonian National Museum of African American History and Culture in Washington DC. Destination Crenshaw will be funded through contributions from local property owners and the private sector, including folks in the entertainment and real estate industries. LA Metro will support streetscape improvements associated with the project, such as new sidewalks, curbs, gutters, street trees and pedestrian safety enhancements. The transportation agency states that “no local, state or federal Crenshaw/LAX Transit Project funds are being used to directly support Destination Crenshaw." View from the east of Sankofa Park, located where Crenshaw Blvd. and Leimert Blvd. split. Rendering courtesy of Perkins+Will. Now the project lands at a time of great change for the area -- big investment -- and with it anxiety -- that with the train will come rising house prices and demographic change in the Crenshaw District. One Leimert Park resident, Feliz McInnis, wondered if Destination Crenshaw will itself be a gentrifying force. “Well it's going to bring more people to the community. Some of it good, I feel some of that might not be so good. Because you know, when places become more popular, the rents go up, unfortunately, and that's the bad side of the whole thing. I just wish the experience could be enriching but keep it so we can stay here,” McInnis said. McInnis’ concerns come amidst protests against art galleries in Boyle Heights and some other neighborhoods. So, could Destination Crenshaw be a Trojan horse for gentrification? “I've been on the curatorial advisory committee for over a year. This is not something that's going to just pop up overnight. 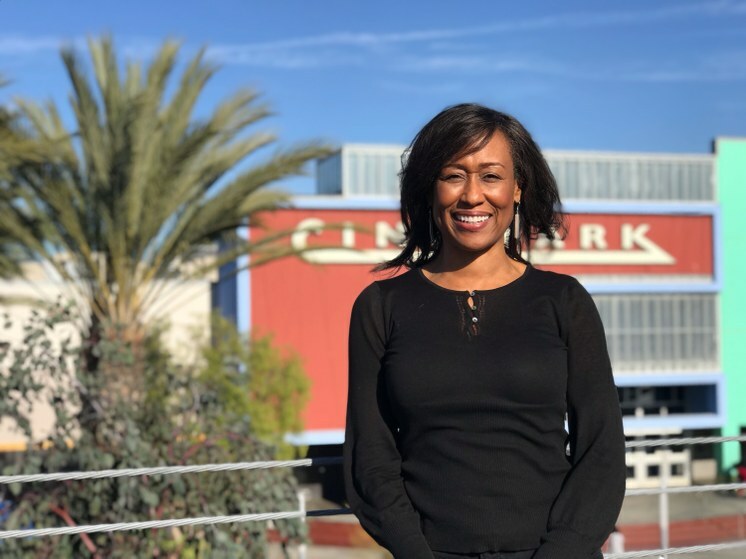 But there has been a lot of community meetings and gatherings and going to churches and different ways of getting out the fact that this is happening,” said Naima Keith, deputy director and chief curator at the California African American Museum. The artists on Destination Crenshaw will be announced this spring and the project will break ground around about that time. It is expected to be completed by the spring of 2020, just as the Crenshaw/LAX line opens. Has LA's art scene finally arrived? If it’s awards season it must be time for art.